I have been lucky to have had many fabulous tastings at Castello di Ama over the years, but this was one of the most remarkable. L’Apparita, a 100% Merlot from high-altitude vineyards in Gaiole, gets less attention than some of its peers, but it is right up there with the very finest wines, not just of Italy, but of the world. Of course, tasting wines with perfect provenance is always a privilege and helps remove any variability that can result from less than perfect storage. Proprietors Marco Pallanti and Lorenza Sebaste are true visionaries. An approach built on painstaking attention to detail, along with an uncompromising commitment to quality and a willingness to take risks places them among the world’s elite producers. 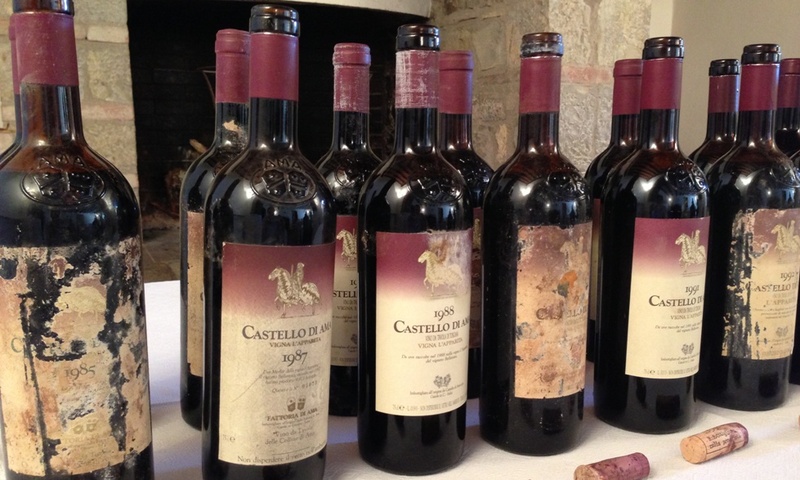 Even from the very first vintages, the Castello di Ama have been stunning. Best of all, the Castello di Ama wines age extraordinarily well. This survey of fourteen vintages of L’Apparita shows that the Pallantis’ intuition to graft Merlot onto existing Canaiolo and Malvasia Bianca rootstocks in 1982 and 1985 was spot on. One of the most fascinating aspects of vertical tastings is the ability to chart the development of a wine over several decades. The Merlot at Ama is usually harvested around the middle of September. Fermentations last between three to four weeks. In its first vintages, L’Apparita was aged in a high percentage of new French oak barrels, as was the custom for high-end wines in the mid 1980’s. Since 2004, new oak has been around 50%, while time in barrel has progressively increased from about 12 months in the 1980s and 1990s to 18 months today. Toast levels have also generally come down. Where to start with this tasting that traces L’Apparita all the way back to the inaugural 1985? I love the 2004 and 2006, two wines that capture the personalities of those vintages; the 2004 silky and polished, the 2006 a total powerhouse. I also admire the 1997, a wine that remains incredibly youthful and primary. Today, it is drop-dead gorgeous. A trio of wines from the early 1990s is stellar. The 1992 is pure refinement, while the 1991 is the product of a very late harvest that stretched into October, and the 1990 an exotic wine from a legendary vintage that more than lives up to its reputation. It is amazing how much a little decanting can do for the 2009 L'Apparita. A stunning, beautifully radiant wine, the 2009 captivates all of the senses. I visited the estate in 2009, during the middle of a huge heat wave. I expected to find a much bigger wine in the glass, but ultimately, the 2009 is medium in body and all about finesse. This is a fabulous Apparita graced with exquisite aromatics and tons of pure class. I imagine the 2009 will enjoy a broad drinking window, but like all Apparitas, the best comes with time. Drinking window: 2015-2029. The 2007 L'Apparita is a bit richer and deeper than the 2009, but it never loses its essential personality. Hints of tertiary complexity are just beginning to develop now that the 2007 has been in bottle for a few years, but the wine is in an in between stage where it is neither young nor mature. Tobacco, wild flowers and menthol are some of the many nuances that emerge over time, but today the 2007 isn't quite ready to show all of its cards. Personally, I would wait a few years more. This is a stunning Apparita from Castello di Ama. Even though 2007 is regarded as warm vintage, this fruit did not come in until September 17, slightly late by Ama’s historical standards. Drinking window: 2017-2027. One of the highlights in this vertical, and easily one of the finest Apparitas ever made, the 2006 has it all. Fruit, acidity and structure. It's all there. Rich and powerful, the 2006 is beautifully nuanced and articulate from the first taste. Wild herbs, flowers, tobacco, black cherries and graphite all jump from the glass. Saline and savory notes abound in a massive yet detailed Merlot loaded with class and personality. Simply put, the 2006 is stunning. Readers who purchased this wine upon release are going to be thrilled. Drinking window: 2015-2031. 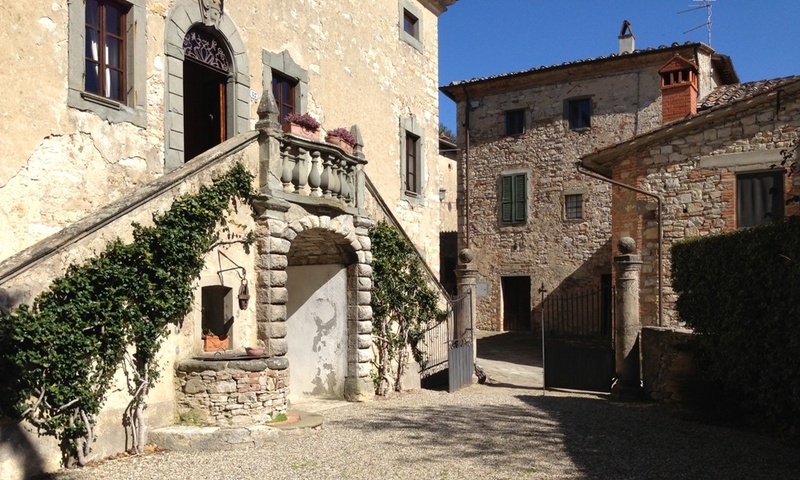 The 2004 L’Apparita shows the finesse that is the hallmark of this great Tuscan vintage. A silky, nuanced, feminine wine, the 2004 is pure class. Sweet tobacco, spices, flowers and dark red berries all flesh out in the glass. Today, the 2004 is a little more refined than the 2006. I hope to be able to taste them both again some day in the future. A superb, textured finish makes it impossible to resist a second, and then a third, taste. This is a wine of the heart and soul. Wow! Drinking window: 2014-2034. The 2001 L’Apparita is the first wine in this tasting that shows tertiary complexity. Truffles, black pepper, spices, tobacco and incense literally jump from the glass, before the massive fruit hits the palate. Still a baby, readers lucky enough to own the 2001 can look forward to another 15-20 years of very fine drinking. Today, structure and power dominate. This is another impressive showing. Drinking window: 2015-2031. The estate's 1998 L’Apparita is another wine that is quite true to the vintage, although in this case, that is a bit problematic as the tannins are noticeably green. The finesse and sheer pedigree of the best years is elusive. At this point, it is hard to see the 1998 improving with more bottle age. The beauty of the bouquet never fully translates onto the palate. Drinking window: 2013-2020. The 1997 L’Apparita remains fresh, vibrant and striking in its beauty, with very little in the way of tertiary aromatic development. Still rich, powerful and deep, the 1997 is just beginning to enter the early pear of its drinking window. This is a great showing and easily one of the most impressive wines in the vertical. Hints of bacon, grilled herbs and olives linger on a finish that deftly balances sweet and savory notes with tons of elegance. The 1997 should continue to drink well for another decade-plus. At the time, 1997 was considered a very hot year. Today, those conditions are considered normal. Drinking window: 2014-2027. The 1993 L’Apparita is fascinating. A bit more advanced in its bouquet than on the palate, the 1993 impresses for its depth. I expect the aromas will continue to develop at a faster rate than the fruit matures, suggesting the 1993 is best enjoyed sooner rather than later. When wines are in this state, they rarely improves over time, rather the slight imbalances only become more apparent. Today, the 1993 is a bit wild and unrestrained, but impressive for its huge fruit and imposing structure. Drinking window: 2013-2018. One of the clear rock stars in this lineup, the 1992 L'Apparita is dazzling. Impeccable, refined and elegant, the 1992 Apparita might very well be the single most finessed Tuscan Merlot I have ever tasted. Even today, at 21 years of age, the 1992 is full of bright red fruit. The aromatics remain intensely floral and bright. I can't imagine the 1992 will get too much better than it is right now. The cold growing season nevertheless produced a winner. What a beautiful wine! Drinking window: 2013-2022. The 1991 L’ Apparita is another breathtaking wine. The result of a late harvest that stretched into early October (very late for Merlot), the 1991 dazzles all of the senses with its deep fruit and fabulous overall structure. Still deep, rich and intensely flavored, the 1991 will drink well for another decade, if not longer. Savory notes add shades of dimension on the authoritative, positively salivating finish. Marco Pallanti calls the 1991 L’Apparita his most Bordeaux-like wine. Drinking window: 2013-2021. Exotic and beguiling, the 1990 L’Apparita is another of the many emotionally moving wines in this vertical. Mint, pine, licorice black cherries and sage some of the notes that are woven into a mosaic of notable class and elegance. Still rich and powerful, the 1990 has more than enough fruit to drink well for another decade, perhaps longer. I am amazed at how fresh and vibrant the 1990 remains, a true rarity among Tuscan wines from this precocious vintage. Drinking window: 2013-2023. When all is said and done, the 1988 must t be considered among the greatest of the L’Apparitas. Hard candy, rose petals and cloves lead to layers of expressive red fruits in the 1988 Apparita. A sensual, heady wine, the 1988 is all about ripe, racy fruit and exotic aromatics. The 1988 has barely budged since I last tasted it a few years ago. White truffles and pomegranate are some of the nuances that add raciness and pure flair on the finish. I especially like the vibrancy and purity of the fruit here. The harvest too place on September 30, quite late for Ama and Merlot in general. Drinking window: 2013-2020. The 1987 L'Apparita is the first wine in this tasting that is totally mature. Beef bouillon, earthiness, tobacco and worn-in leather inform the powerful, if rustic, finish. There is no reason to hold any remaining bottles further. Low temperatures in the spring delayed flowering by a good two weeks, while the weather during the rest of the year was uneven. Drinking window: 2013. A gorgeous wine, the 1985 L'Apparita is pure silk on the palate. Subtle and graceful, the 1985 impresses for many things, including its balance. Just as important, though, this first vintage of L'Apparita is still beautiful and finessed. Tasted within the context of the vintages that followed, the 1985 comes across as mature and not particularly complex, but it has nevertheless held up well over the last nearly thirty years. That is more than enough in my book for one of Italy's most groundbreaking wines. Drinking window: 2013-2015.